The project explores an archetype of architecture, the staircase, transporting it into a place of estrangement, building a small geometric universe that manipulates the visitors’ perception and their relationship with the surrounding space. 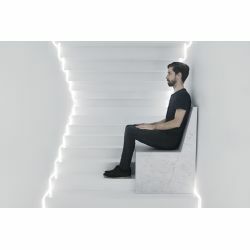 The idea is a collection of marble furniture that exists in this environment of constant movement, where these objects rest on the shape of the steps. As the furniture is placed on a flat surface, they are integrated with black Marquina marble elements that fill the bases and bring us back to the dynamics of this place.